Bermuda Hospitals Board has expanded cardiac testing and now provides CT angiography as well as cardiac calcium scoring on island. “In CT angiography 3D images of arteries that supply blood to the heart are taken with a CT scanner. The test can help determine the cause of chest pain and may indicate blockages in these vessels and conditions like atherosclerosis,” BHB explained. “While calcium is good for building strong bones and teeth, calcium deposits in your blood vessels puts you at risk for developing heart disease. 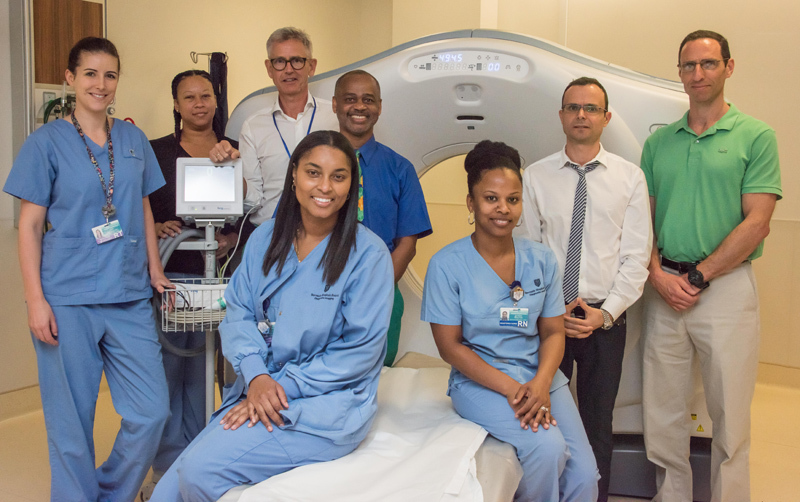 One of the new tests now available at King Edward VII Memorial Hospital [KEMH] uses CT scanning of the heart to determine calcium deposits in the coronary vessels. 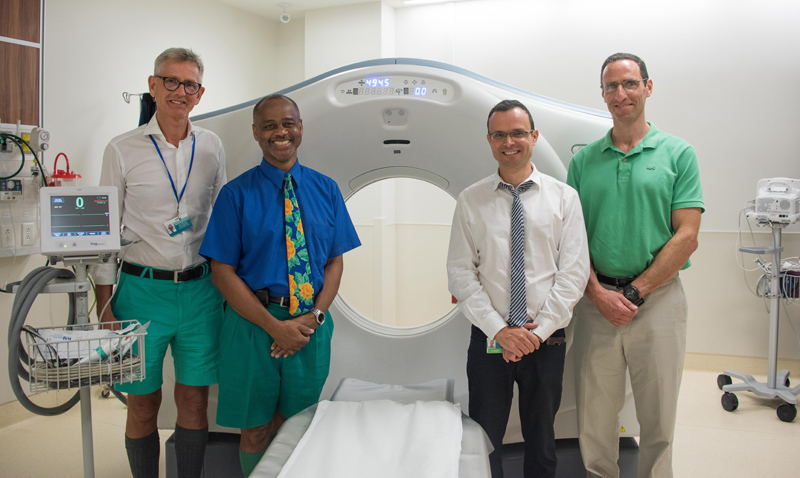 “The collaborative initiative between the cardiology and radiology departments now provides our community with comprehensive cardiac computerized tomography [cardiac CT]. The programme started earlier this month coinciding with Heart Month. About 15 people have used the service so far. “The tests are read and interpreted at KEMH. Two physician specialists; Dr Joseph Yammine BHB Consultant Cardiologist and director of the programme, is American board certified in cardiac computed tomography and Dr Anders Hauggaard BHB Consultant Radiologist is Level II Accredited in Cardiovascular CT Experience Program by the American Heart Association with vast experience in this area. Dr Hauggaard was an early adopter of this technology in his previous works in Sweden and the Arabian Gulf. Dr Yammine and Dr Haggard noted: “This programme, where we provide calcium scoring for cardiac risk screening and coronary angiography for assessment of coronary disease and overall heart conditions, is of great value to the community. This is the same thing that Brown Darrell Clinic has been doing for 4 years. This cant be more real. So you shut down Brown and are getting caught up to speed and acting like this is new tech. ago we didn’t even have one cardiologist, now look what we have. It’s a shame my late father isn’t here to see it, he would be so surprised. Cardiac CT studies have been done at Brown-Darrell for eight years‎ “without problems”. They were allegedly scanning lots of people with no problems. Was any of the employees from Brown Darrell who has been performing these functions for over 8years employed with government..who caused them in part to now be unemployed.. It is amazing how many negative comments are on here without any knowledge of the situation. This was being done whether or not Dr Browns clinic was closing or not. And no one that worked at Dr Browns, lost their job to one of these employees. They were gainfully employed long before this – no new roles were created or lost. You should ask Dr. Brown exactly who lost their job since you are so eager to know. He disclosed everything but that. I have nothing against Dr. Brown or his clinic. Yes they were providing this service long before the hospital but each establishment provided services that the other didn’t. Could you go to Brown Darrell at 3am in case of an emergency? No you couldn’t. So now the hospital has expanded its services to provide something else and all you get is complaints. It was happening whether he closed or he didn’t. Get over it.